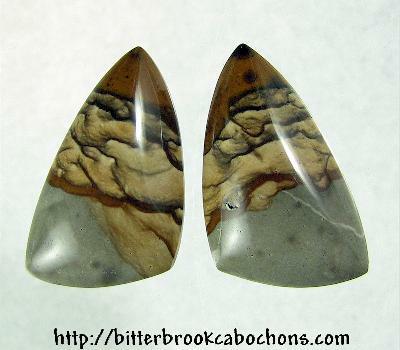 Symmetrical freeform-cut Picture Jasper cabochons! I don't know what type of Picture Jasper these are; could be Deschutes County or Biggs. One has a tiny vug and a small fracture. Perfect for earrings or BFF pendants! Each cab is 25mm x 15mm x 6mm. Tot. Weight: 29.50 carats.